More than two weeks after Hurricane Maria made landfall in Puerto Rico, the island is still far from recovered. Fewer than 1 in 8 Puerto Ricans have electricity, and roughly half of the island is still without drinking water. The official death toll is at 36, but it is expected to climb further as recovery efforts continue. What's next: Vice President Pence touched down in Puerto Rico this afternoon where he'll participate in a prayer service and receive an update on hurricane relief efforts. 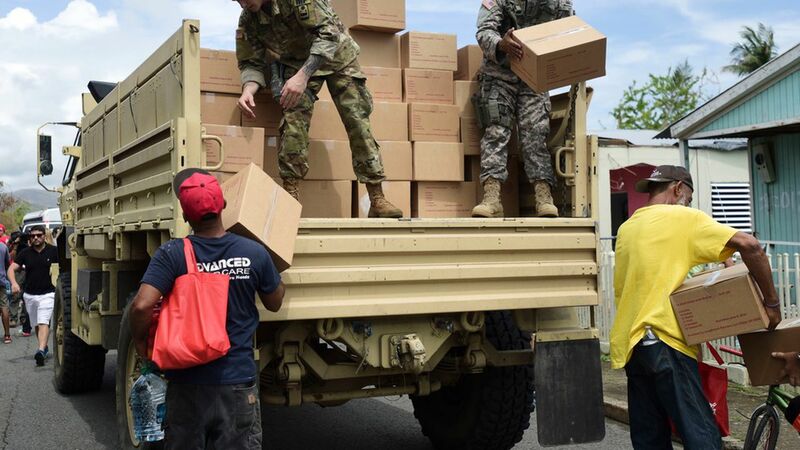 Boots on the ground: More than 15,100 federal civilian and military personnel, including more than 800 FEMA personnel, are on the ground in Puerto Rico and the U.S. Virgin Islands. Food: Approximately 65% of grocery stores are open. Gas: Roughly 78.18% of retail gas stations are operational. Transportation: More than 32.7 miles of roadway has been cleared; 100% of federally maintained ports are open or open with restrictions; and 100% airports are open. Water and waste: More than 55.5% of Puerto Rico Aqueduct and Sewer Authority (PRASA) customers have potable water. 64% of waste water treatment plants are working on generator power. Medical care: The Department of Defense's hospital ship, USNS Comfort, arrived in Puerto Rico on October 3 to provide additional surge capacity if needed; 97% hospitals and 96% Dialysis Centers open, but several medical centers are still running on generators and backup power systems, leaving most of them without air conditioning. Supplies centers: As of October 6, PR Gov. Ricardo Rosello established 10 Regional Staging Areas around the island, serving all 78 municipalities. The National Guard is delivering supplies to those centers. For more: The Puerto Rican government is updating the latest information on the state of the island on Status.pr. Go deeper: The road to recovery for Puerto Rico; Lin-Manuel Miranda released a single for Puerto Rico.